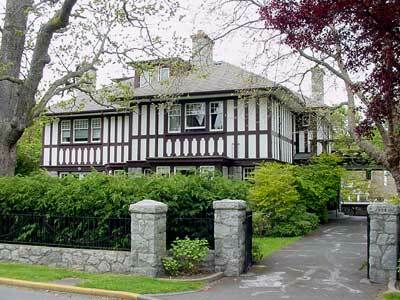 Glenlyon is a 2½-storey, hip-roofed, Tudor Revival Arts & Crafts house. There are three flat-roofed dormers with small modillions, the front and side dormers have three leaded glass windows. The upper floor is half-timbered, accented under the windows with arched detail; this detail is modified on the porte-cochère balustrade. The main floor and porte-cochère piers are of rustic granite. The front entrance porch is recessed under the porte-cochère. The street façade has a wide projection on the right, separated from the main wall by an angled entry bay; the projection has a central one-storey, flat-roofed box bay. The left side of the house has a similar box bay. Windows are all multi-lights-over-one, often in groups of three. Prominent granite chimneys have flat, over-hanging concrete caps. The low front wall and heavily-capped gate posts are of granite; the wall retains its decorative swag wrought iron fence. Glenlyon was built for $20,000; in 1953 it was converted into suites by Eleanor Yager, one of Victoria’s first female architects, for Grace and Claude Belcher. 1914-15: John Ross owned it for only one year. 1916-17: Widow Laura Martin Fraser (née English, then Clinton, b. San Francisco 1873-1958) came to Canada with her family in 1874. She was a widow when she married James Sutherland Chisholm Fraser in New Westminster in 1903. He became manager of the Victoria branch of the Bank of Montreal in 1912 and they lived at 1715 Rockland Av. He died of ptomaine poisoning in Toronto in 1914. 1918: Canadian Bank of Commerce manager William Hamer Hargrave b. Quebec c.1867) and Lily Blanche (née Sicotte, b. St. Hyacinthe, QC 1857- 1928). They lived in 1007 Joan Cr in 1920-21. 1920: Harry and Margaret Bullen moved here from 1007 Joan Cr, Rockland, while their home 906 St. Charles St was being built next door. 1923-47: Lorne Argyle Campbell (1871-1947) and Mary Spahr (née Hosier, b. Jamestown, OH 1881-1941) Mary came to Canada in 1902 and married Lorne in 1903. Lorne was born in Perth, ON, where he took a degree in electrical engineering. In 1889 he joined Edison General Electric Co in Toronto, and became chief engineer of its successor, Canadian General Electric, in 1891 at 22 years of age. He moved to BC in 1898 and settled in Rossland as general manager, then vice-president of West Kootenay Power & Light. In 1912 he was elected MLA for Rossland-Trail, and from 1916-20 he was Minister of Mines for BC. The Campbells moved to Victoria in 1923. By the 1940s Lorne was president of West Kootenay Power & Light and the McGillivray Creek Coal & Coke Co, and a director of Consolidated Mining & Smelting Co. Although Lorne lived in Victoria for about 20 years, he was more closely associated with Rossland; he returned there in 1946 and died the following year. The house and contents were sold by auction in September 1947. 1948-51: William T. Henry, proprietor of Tweedsmuir Mansions, 900 Park Blvd, Fairfield. 1953-58: Grace Jean (née MacDonald) and Claude Alfred Belcher (b. Kelliher, SK 1908-1957). Claude came to Victoria in 1924. He and Grace married in 1931 in his home at 1555 Pembroke St, Fernwood. At the time Claude was a police officer and Grace a registered nurse. By the 1950s, Claude was a real estate salesman with Rithet Consolidated Ltd. Grace was living at 1400 Newport Av in Oak Bay by 1963.